The onset of Wegener's Disease can be signalled by a number of different symptoms, which, along with it's relative rarity, makes the disease quite difficult to diagnose. I talked about the symptoms of Wegener's in this previous blog. There is no single test to diagnose GPA. Many of the symptoms of Wegener's are similar to other diseases so many people have found that they have been incorrectly diagnosed with a more common disease such as lung cancer, rheumatoid arthritis or Tuberculosis before GPA is considered. You'll probably be feeling generally unwell, have a fever and have lost some weight. Your doctor may consider Wegener's if you display those symptoms alongside things like persistent earache, nosebleeds and sinusitis, breathing difficulties or coughing up blood, or blood in your urine. You will generally need to be displaying a combination of at least two sets of symptoms for Wegener's to be considered. If your doctor suspects Wegener's Disease they may request blood tests to check your ANCA levels (antineutrophil cytoplasmic antibodies). As I explored in my blog What is Wegener's Disease? these antibodies are the ones that attack your body's own blood vessels. The test is not specific enough to diagnose Wegener's on it's own - the test results can come back negative, even if you have GPA. Around 90% of Wegener's patients will have a positive ANCA test. This drops to around 60% for those fortunate enough to have a more limited Wegener's involvement (where the lungs and kidneys aren't affected, for example). Not all ANCA tests are the same. A particular type of ANCA is highly specific for Wegener's disease and affects 70% of sufferers. It is recognised by cytoplasmic staining pattern (c-ANCA) and is directed against an enzyme, proteinase-3. Protoplasmic-staining perinuclear antineutrophil cytoplasmic antibodies, called p-ANCA, occur in 70% of people with Wegener's granulomatosis. A positive test result for rheumatoid factor occurs in roughly half of all Wegener's sufferers and can be misleading because this normally indicates rheumatoid arthritis. Alternatively, your doctor could order a tissue sample in order to look for evidence of inflammation where the white blood cells are clumping together in granulomas. A biopsy of an artery or the area around a blood vessel is especially useful if your skin, nose, lungs or kidneys are affected. A tissue sample will also rule out any other type of infection. Like the ANCA test, a biopsy is not a foolproof way to diagnose Wegener's as the typical features of inflammation and granulomas may not be present. Other, more complex test may be required to definitively diagnose Wegener's Disease. These may include chest X-rays to see if your lungs have been affected. The X-ray may be abnormal and show nodules, shadows or cavities. A CT scan (computed tomography scan) of your head may be required to see if your sinuses, nose or ears have been touched. 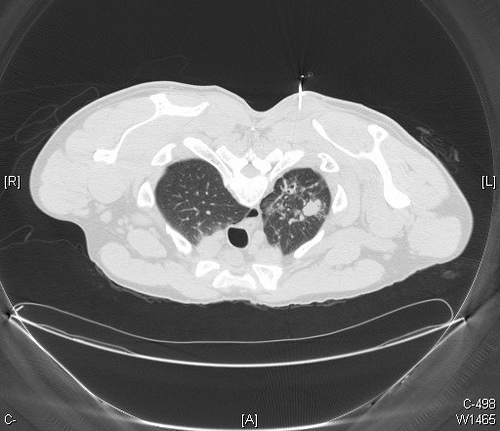 Any thickening of your sinus lining will show up in the CT scan. Finally an MRI (magnetic resonance imaging scan) of the relevant organ may be needed. As you can see, diagnosing Wegner's Disease can be very difficult. It is important for people who suspect they have Wegener's Disease to give their doctor as thorough a description of their symptoms as possible so that the diagnosis of Wegener's can be made as early as possible.